The figure known as Uta von Naumburg is considered by many to be "the most beautiful woman of the Middle Ages." 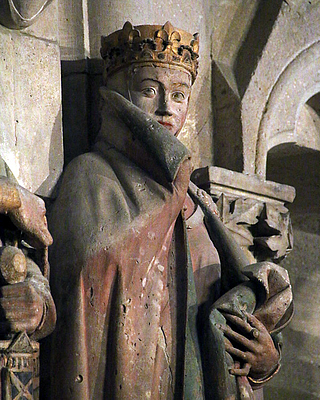 The daughter of the Count of Ballenstedt lived around 1000 - 1046 and became Margravine of Meissen through her marriage to Ekkehard II, one of the founders of the cathedral. However, there are doubts in research as to whether this figure really is the historical Uta von Ballenstedt. She wears a crown which at that time was reserved only for women from royal families. But the only woman of royal descent among the founder figures is Reglindis (* around 989 - 1016), daughter of the Polish King Bolesław I. Chrobry and the Sorbian princess Emnilda. The attribution of the names of the male founder figures is also questionable. The inscriptions on the shields were only added during later restorations.